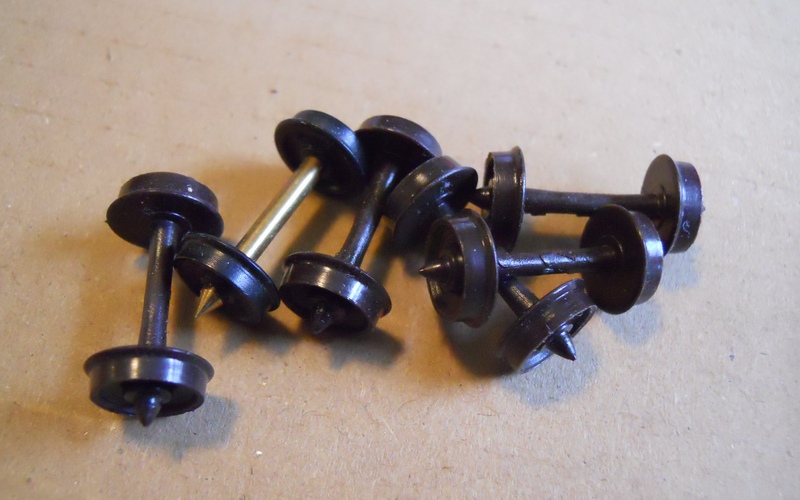 Like a lot of other model railroaders, I have been in the continual process of upgrading my rolling stock fleet to metal wheelsets. The metal wheels look and sound so much better than the plastic ones, they add weight to the cars, and they keep the track cleaner. They cost a bit, but they are some of the most efficient money you can spend on your cars. The advantages are numerous, but they are not the point of this article. One of the down sides of changing out wheelsets is the inevitable by-product: loose plastic wheelsets. Not too terribly long ago, In my media room, which often doubles as my hobby workspace, I heard the unmistakable sound of the love of my life stepping on a wheelset. Whether you’ve heard it coming from yourself or someone else, I suspect most modelers will know this sound in one form or another. Suffice it to say, moments like that are not the best in terms of maintaining domestic tranquility. I must say, I’ve generally been pretty good about keeping parts off the floor, but once in a while it happens, and, of course, the offending part will lie in wait under the sofa until such time as the love of my life walks by. Throwing the things away seems like an option at first blush, but really, how could you? They just look like they have to be good for something! On a train watching trip a few months ago, I saw something that gave me the answer to the riddle. I saw a flat car loaded two layers deep with wheelsets. Do a search of any of the popular rail photo sites and you’ll see what I’m talking about. At some point the prototype railroad is going to need to transfer a load of wheels from one place to another, and what better way to do it? The load I saw that day appeared to be well-used wheels, so I imagine they were going somewhere for some major reconditioning. As soon as I saw that flatcar, I knew what I must do. 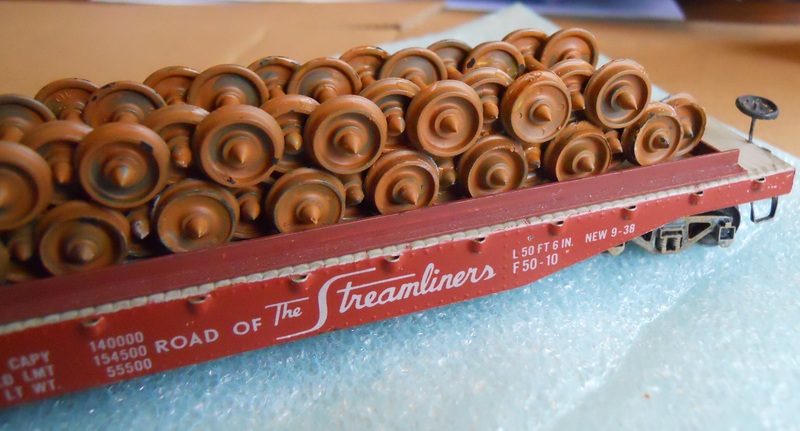 For the next several evenings, as Mrs. Zennmaster and I sat in front of the TV, I took out my bottle of Polly Scale Rust and painted up a bunch of plastic wheelsets. This particular bottle is one that use exclusively for weathering and projects like this. It’s an old bottle that I haven’t been particularly hygienic about, as far as things like keeping it free of water and small contaminants. This way it goes on very unevenly, which is great when you’re simulating the effects of natural processes. For this reason, when you go to paint your wheelsets, make sure not to do too good of a job. These wheels are supposed to look like they’ve seen better days, and have probably been exposed to the elements for an extended time. If the paint gets some bubbles in it, that’s great! It will end up looking very rough, which is what we want. 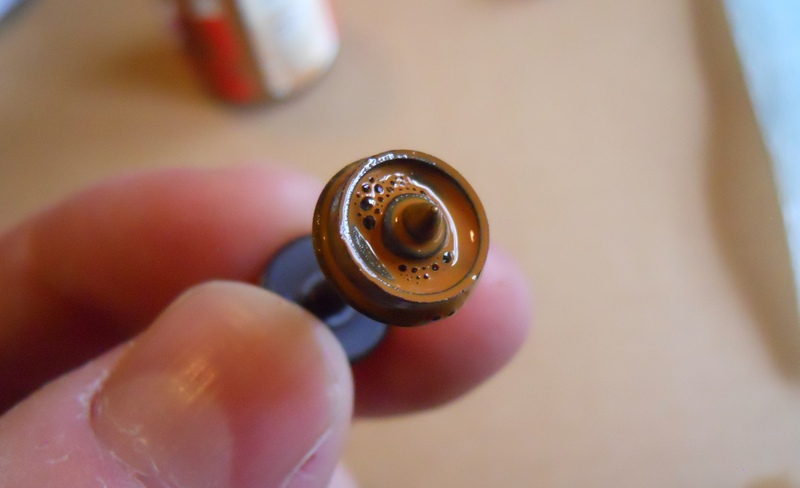 Painting the wheelsets: Make sure not to do too good of a job! 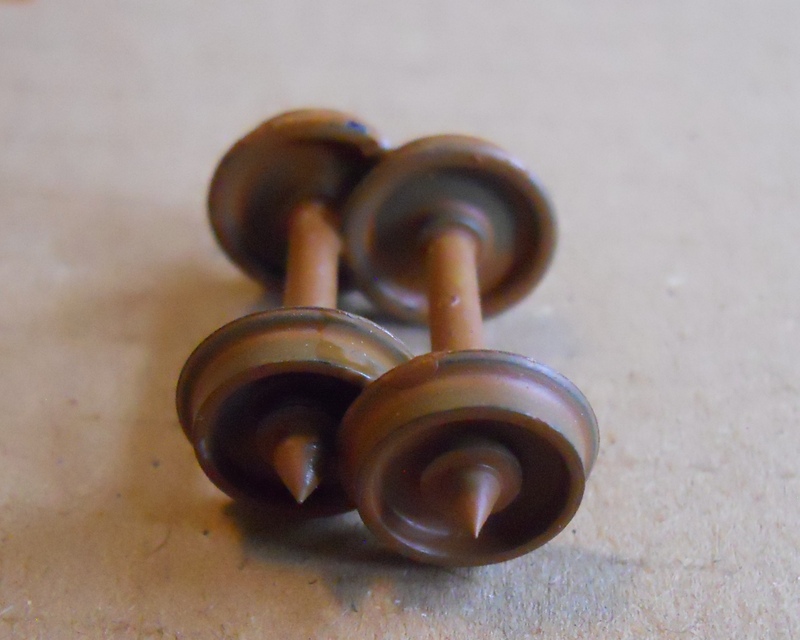 When I finally had thirty or so wheelsets ready, I glued them together in pairs, using a drop of superglue. Wheelsets glued together into a pair. The first layer of wheelsets, this is comprised of sections of 3-4 pairs glued together. I then stacked on a second layer that was one wheelset shorter on each end. I didn’t glue this layer to the lower one, and I didn’t glue it together, I just stacked the pairs on top of the existing layer. 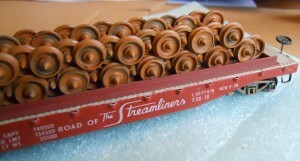 The second layer of wheelsets are just unattached pairs stacked on top. If you’re planning to carry the load in a gondola, you can call it complete at this point: just drop it in the gon and away you go. 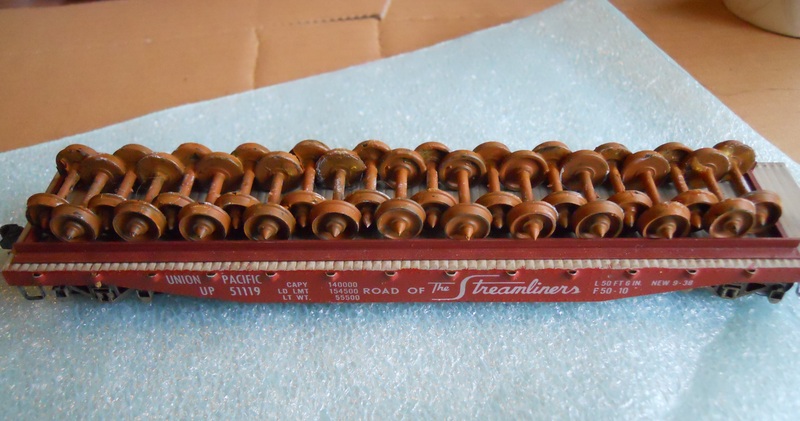 If you’re looking to put this on a flat car, you’ll need to build some sort of structure to keep the wheels from flying off. 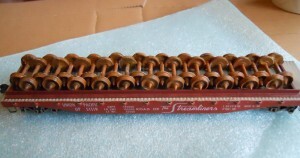 The wheelset retainer, made of four pieces of angle and brush-painted boxcar red. Detail of the joint between long and short members of the wheelset retainer. 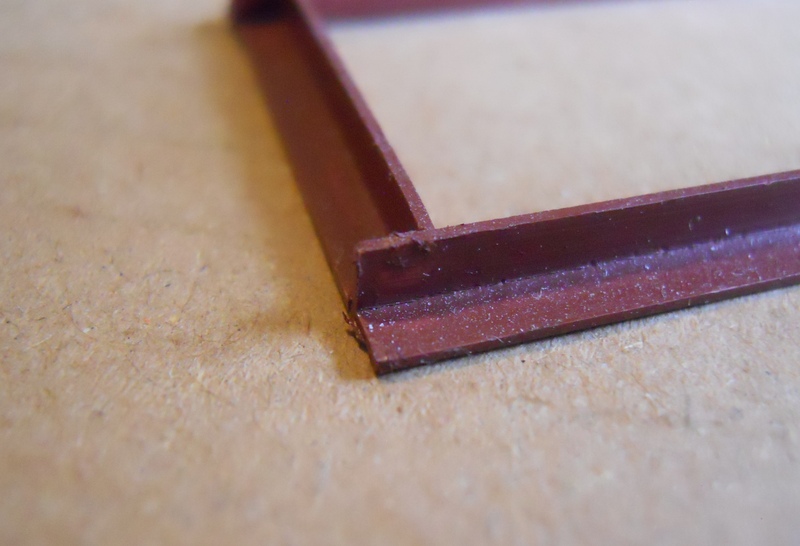 I used some styrene angle. This is probably the simplest possible approach: I just cut two pieces of angle a little longer than the load, then cut two smaller pieces a little shorter than the width of the load. Two long, two short. I simply placed all the pieces against the load and marked them. I then joined them all with a drop of MEK (any liquid cement should work fine). I then brush-painted the retainer boxcar red. 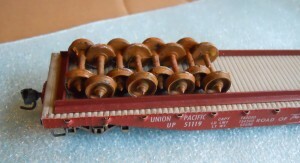 As it is, the weight of the wheelsets is enough to keep the load in place at reasonable model railroad speeds. All the prototype photos that I’ve seen of this kind of load indicate that the exact method for keeping the wheelsets in place is anything but standardized. I would call my method a “Plausible Freelance” approach. Of course, if you are really interested in getting it exactly right, refer to a specific photo. The next step for me will be to drill some #72 holes in the front and rear cross-member angle sections and string some thread through to simulate a cable tie-down. 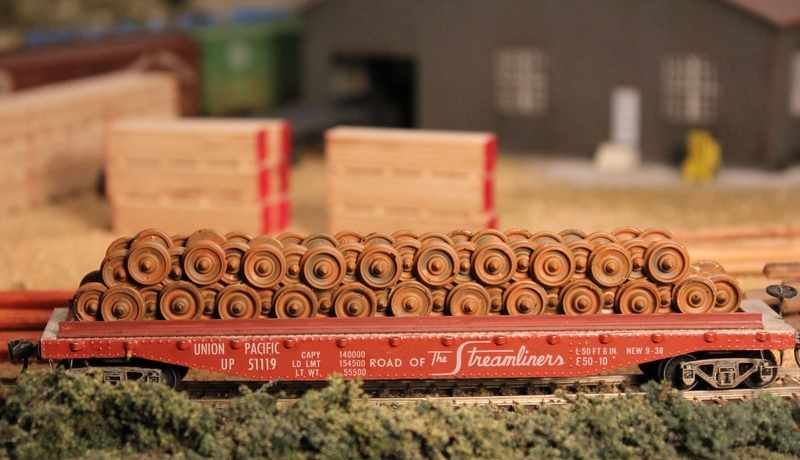 In addition to making an interesting flat car or gondola load, placing a stack of wheelsets near a servicing area or an engine house would add a little bit of visual interest. This was an easy and satisfying project. I enjoy building things for the layout even more when they create a use for something that was one false step away from the trash! Hey, Interesting post, I like the way you write. Just bookmarked your blog. Feel free to mail me, if you have some new information.